FriendSheep: Unnskyld, forstår du norsk? Ja, jeg forstår lite norsk. Place all the flour into a big bowl, add yeast solution and a pinch of salt, and knead well (I mean, really well!) *^v^* You may need to add some water as you go. Form a sphere of a dough and leave it in a bowl to grow for about 30 minutes, under a piece of cloth. Take a grown dough out of the bowl onto a flat surface and knead once more thoroughly. Divide it into two loaves, place it on a baking tray not very close to each other and leave them for another 20 minutes to grow again. Switch on the oven (temperature 180 degree Celsjus). 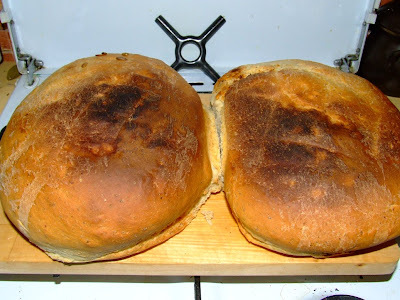 When the oven is hot and the loaves have grown substantially, place them into the oven and bake for about 30 minutes. You may cover the loaves with a piece of tin foil to avoid burnt crust. After about 20 minutes check the bread with a long thin wooden toothpick - if the toothpick is dry, the bread is baked and can be removed from the oven. Leave the loaves for about half an hour to rest. Ja, jeg forstår lite norsk = Yes, I understand very little Norwegian. Ja, jeg forstår litt norsk = Yes, I understand some Norwegian. dziekuje, nawzajem! piekne bohenki chleba..mmm az tu pachna w dalekiej australii! !